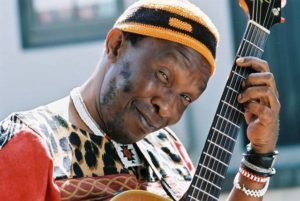 One of South Africa’s greatest guitarist, music veteran, performer, father and husband Madala Kunene is giving his all to raise awareness about the environment. At 67 years old he is without a doubt king of the Zulu guitar and Zulu blues – and he is one of the leading greats involved in the Dim-Dep Enviro Blitz, which kicks off its campaign on Tuesday, April 24, 2018. Making a great return to the theatre production: Dim-Dep: Faces of Environmental Success, Kunene is scheduled to be the opening act of the musical this year. The legendry guitarist and musician will brace the audience with symphonic sounds of jazz and mild blues. Not only will he be accompanied by his favoured instrument, the guitar but he will also have with him “isitolotolo” (mouth harp). Some songs which he will perform include “Gumbela” and “Undendezana”. Kunene will be part of the environmental awareness with the cast in the coming months. “I have always been involved in my community and always try to convey a message. When I perform I reach out to people about what is important,” he said. Kunene was born in Kwa-Mashu, KwaZulu-Natal. His music genre is flexible just like the strings on his guitar. His sound is a transfusion of cool jazz, maskandi, mbaqanga and East Coast melancholy. Still one of the music legends from the 90’s who is a figure of virtual anonymity his music has an acquired taste among jazz and blues enthusiasts. Called to be a musician, his love for music was already ignited from an early age as he started off as a busker at an early on Durban’s beach-front at the age of seven, making his first guitar out of a cooking oil tin and fish gut for the strings, soon becoming a popular performer in the townships. 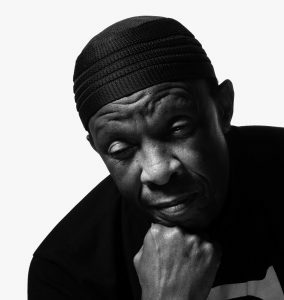 Kunene was discovered by Sipho Gumede who later brought him to “the city of gold” Johannesburg where he performed with prominent musicians such as Winston Mankunku Ngozi, Busi Mhlongo and the late Hugh Masekela, to name a few.Kunene has performed in countries such as Germany, the United States, Switzerland and France. When he is at home he is favourite at the Durban’s KZNSA Gallery as well as the Elizabeth Sneddon Theatre at the University of KwaZulu-Natal.